Well, we are here again: another signal day near market highs on an index. The index is the NYSE Composite this time. 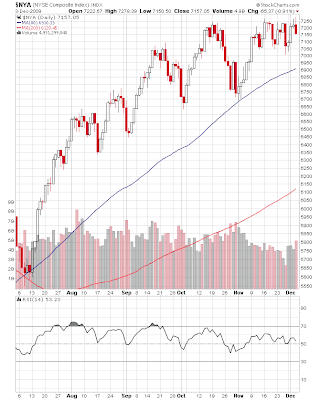 The same short term sell signal came up on the COB 21st October on the S&P. *The market has been in a trading range for 3 weeks rather than running up and then giving a reversal signal. This gives a reversal signal less predictive success. * You may recall that recently Bob Prechter was pointing out some non-confirmations - some indices were failing to hit new highs at the same time as the broader market indices. Apart from the AMEX, all the major indices have hit new highs since Prechter's comment, so those non-confirmations have gone. The DJ Transports and Utilities indices appear to be breaking out to the upside. * There is not a clear non-confirmation on the advancing - declining issues indicator (second graphic). 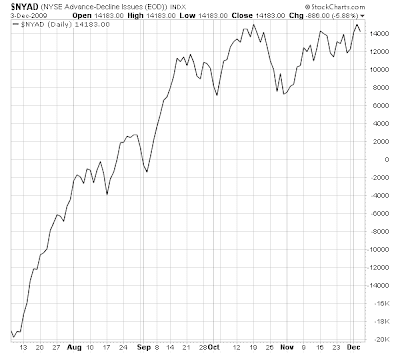 So breadth is in line with price at the broad index level. * The market is going up with less short term thrust on each up-leg. Volume confirms this. *Yesterday's down day was on the biggest volume for a month on NYSE trading. Was that a clean-out cathartic day? Even on the big volume down day there were a lot more new highs than new lows on the various stock exchanges. The probabilities have shifted to less negative scenarios by market action over the last week or so. In particular the break outs to new rally highs by various industry sub-groups allows for some market leadership. The postive seasonal bias may kick in this month, particularly after a positive November. Some hedge funds are still gunning to make their year, though others will be planning how to spend their performance fee bounty already. On balance a trading environment with a positive bias.